Single-photon emission computerized tomography (SPECT) and positron-emission tomography (PET) imaging are highly sensitive techniques that allow for the non-invasive detection, quantitation, and response monitoring of a broad array of diseases through target visualization and kinetic modeling. The selection of a target for nuclear imaging requires a deep understanding of the disease process and physiological changes that are to be evaluated. The target itself may be protein expressed on cells of a particular organ, a receptor on circulating blood cells, or a biochemical or metabolic pathway in cells throughout the body. Targeted radiotherapy has emerged as a highly promising modality across a range of diseases, and the selection of targets for therapy is dependent on the radionuclide utilized, the biology of target expression, and the sensitivity of cells to radiation treatment. 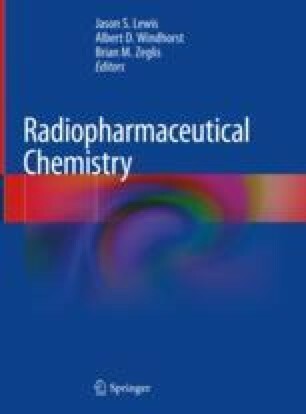 This chapter reviews the basis of target selection for radiopharmaceuticals and provides examples of the successful clinical use of targeted imaging and therapy. The authors acknowledge support from NHMRC (grants 1092788, 1143710, 1084178), Cancer Council Victoria, and Operational Infrastructure from the Victorian Government.